Life was just beginning for our daughter Brittney. She had graduated from the University of Iowa in May, had begun a job in counseling at a women’s center, and was doing the mission work that she loved on the side. On December 17, 2005 she went to the hospital with what she thought was appendicitis and by January 17th, 2006 she was in surgery with Stage 4 adenocarcinoma. The cancer not only was in her colon, but had already spread to her ovaries and liver. 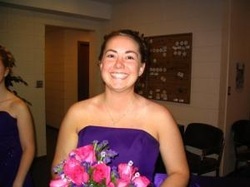 Brittney fought cancer like she tackled the numerous mission trips that she went on. She touched the lives of people in Colorado, Kentucky, Indian reservations in Oklahoma, the survivors of Hurricane Katrina, orphanages in Mexico, and college campuses in El Salvador. During her two and a half year battle with colon cancer she touched the lives of nurses, doctors, lab technicians, other patients, family, and friends with her bright smile and determination to make other people feel good. SuperMann became her nickname from the people around her as she smiled bravely through allergic reactions to chemotherapy, blown ports, horrific rashes, losing her hair not once but twice, IV’s that would not go in, terrible swelling in her abdomen and legs, and the comment “that has never happened before”. She began her journey through cancer at Mercy Hospital in Iowa City, Iowa. After 10 months of chemotherapy she received the wonderful news of remission. Two months later the cancer was raging again and we went to Mayo Clinic in Rochester, Minnesota for more chemo therapy, radiation, and a clinical trial. None of this worked and she was sent to the University of Iowa Hospitals for another type of chemo. This treatment had to be stopped due to her liver shutting down and Brittney went home to be with God on June 26, 2008. As she came to the end of her life here on earth her main concern was for her brother, parents, extended family, and friends. We all miss her wonderful smile, mischievous giggle, and love for everyone around her. If there is one thing that we as a family can do to honor her memory it is to care for the less fortunate as she tried so hard to do in her short 25 years of life.